Germany’s latest World Cup adventure is off to the ideal start. The three time World Cup winners defeated the Soccerroos by a four goals and perhaps could have won by an even greater margin. The Australians, who enthralled fans en route to a place in the Round of 16 in 2006, must now plan for the game against Ghana without the talismanic influence of Tim Cahill. The Everton midfielder was harshly shown a red card by Mexican referee Marco Rodríguez for a mistimed lunge at the legs of Bastian Schweinsteiger. The rout was initiated early on. Lukas Podolski’s form in the Bundesliga was a matter of huge concern for the passionate followers of Die Nationalmannschaft, but his powerful finish past Mark Schwarzer in the eighth minute quelled any uneasiness surrounding his inclusion in the starting eleven. The move began with Mesut Özil defying the Australian midfield before sliding a precise through-ball in the direction of Thomas Müller. The Bayern München forward pulled the ball back across the goalmouth where it was met by the onrushing Podolski who promptly opened the scoring with a forceful effort through the hands of Mark Schwarzer. From that point Germany were the only team displaying any meaningful attacking impetus. Müller and Özil were at their inventive best. The duo, both members of the Under-21 side that captured the European Championships in 2009, and Podolski operated in an impressive three man line behind Miroslav Klose. Klose’s selection was another contentious issue for the German public. So much so that Jogi Löw was forced to defend the Bayern München Stürmer in the build-up to this fixture after he had failed to instill confidence following wasteful displays in the World Cup warm-ups. It would have been forgivable to believe that Klose’s dreadful form would continue when he lashed a perfect cross from Lukas Podolski high and wide little more than twenty minutes into the game. Klose’s grimace perhaps betraying a lack of confidence. Redemption was swift. A wonderful cross from the deep-lying Philipp Lahm drew Schwarzer foward where he was beaten to the ball by a brave header from Klose, doubling Germany’s advantage on the half hour. The intrepid Mesut Özil was unlucky not to add to the tally shortly after. Another dazzling passage of play saw the Werder Bremen starlet clip the ball over Schwarzer only to see it sliced off the line by Lucas Neill. With the first half ending, Germany continued to forage for a third goal. Bastian Schweinsteiger and Sami Khedira combined attacking intent with their defensive duties as they persisted in attempting to force passes through a brittle Australian defence. Any faint hopes of a SoccerRoo revival were scotched ten minutes into the second half. Tim Cahill, playing as Australia’s lone striker, lunged clumsily at the feet of Schweinsteiger and was promptly dismissed by the Mexican referee. Television replays suggested that the decision was a harsh one. The red-card any lingering Australian attacking intentions and allowed Germany decelerated the tempo. Captain Philipp Lahm continued to move the ball forward while the Polish-born pair of Podolski and Klose demonstrated the same chemistry that was so compelling in the 2006 tournament. The twosome combined magnificently just after the hour mark before Schwarzer denied Klose, who failed to make further indentations into the World Cup goalscoring record of Ronaldo. Klose was soon substituted by Joachim Löw and replaced with Cacau. Müller crowned his enthralling display with a well deserved goal in the 67th minute. Podolski marauded towards the Australian penalty area. He laid the ball off tidily to Müller who dragged the ball away from Scott Chipperfield before emphatically powering a low shot against Schwarzer’s right post and into the goal. 3-0 soon became four. The recently introduced Cacau scored his first international goal as the architect, man of the match Özil, squared precisely for the Stuttgart striker. Cacau’s first-time effort beating the goalkeeper and adding a justifiable gloss to the scoreline. Marin and Gomez were brought on with the day’s business concluded. Jogi Löw is certain not to dwell on the implications of this handsome victory beyond the forthcoming showdown with Serbia, who were outplayed and beaten by Ghana in the group’s earlier fixture. The 4-0 margin was little more than Germany deserved. The warm feelings generated in the Bundesrepublik by their passage to the Semi-Finals in 2006 may be replicated if they can continue to present further exhibitions of glorious teamwork and one-touch passing. For a side that was so ravaged by injury in the weeks preceding the tournament this performance was an impressive reminder that once a World Cup has started, die Nationalmannschaft will always rank amongst the chief protagonists. Italy: Marcello Lippi has removed Marco Borriello and Giuseppe Rossi from his World Cup squad. United States: Veteran USMNT stars Sacha Kljestan and Brian Ching were omitted from the final 23-man roster by coach Bob Bradley. The final 23 is noteworthy for being perhaps the most experienced United States squad ever assembled. The decision to leave out Ching was apparently influenced by the unavailability of Charlie Davies, as Bradley sought to replicate Davies’ pace through young strikers Herculez Gomez and Robbie Findley. South Africa: Veteran Benni McCarthy has been denied the honour of representing Bafana Bafana in a World Cup on home soil. Coach Parreira’s decision was linked with McCarthy’s declining fitness, with rumours suggesting that McCarthy’s body fat index registered at over 24%. Germany: The injury ravaged Germany squad was announced by Jogi Löw yesterday afternoon. Jerome Boateng, the brother of Ghana’s Kevin-Prince Boateng, was included in the squad following injuries to Heiko Westermann and Christian Trasch. FC Bayern München’s Philipp Lahm will captain the side in the absence of Michael Ballack. German captain Michael Ballack will miss the 2010 FIFA World Cup. The Chelsea midfielder sustained a tear of the medial collateral ligament of his right ankle in Saturday’s FA Cup Final. The news was broken by the DFB (German Football Association) in a statement released to their website. The results of the MRI scan in Munich on Monday will gravely impact Germany’s preparations for the World Cup. Die Mannschaft‘s coach Joachim Löw has criticised the challenge that led to the injury. Kevin Prince Boateng, of Ghana, lunged at Ballack with, in Löw’s opinion, “no chance of getting the ball”. The news will boost the chances of Germany’s challengers in Group D; Australia, Serbia and Boateng’s Ghana. There has been no announcement of a new German captain for the tournament. Fullback Philipp Lahm has acted as a stand-in captain for Germany in the past, while talismanic figures like Bastian Schweinsteiger will also be seen as contenders for the honour. Veteran blogger and journalist with DCU’s College View, Niall Farrell examines the prospects of perennial contenders Germany. Odds of 13/1 mean that the old maxim is again in vogue. Germany are not fancied by many pundits, despite an impressive run of form in qualifying and a fine run of form from star players. German football is on a high. For a few years now Bundesliga enthusiasts have raved about the league and its balance of profitability and fan-friendliness. This year, the Bundesliga chickens came home to roost. Bayern Munich have made the Champions League final with a spine of German players- something that would have been almost unthinkable a year ago. “Die Mannschaft” have taken Bayern’s success and the rude health of the Bundesliga and crafted a team that on first glance don’t seem all that talented. On second or third viewing, the German team bear the usual hallmark of efficiency but with a flair that is usually absent from German lineups. The main strength of the German team lies in a settled midfield. 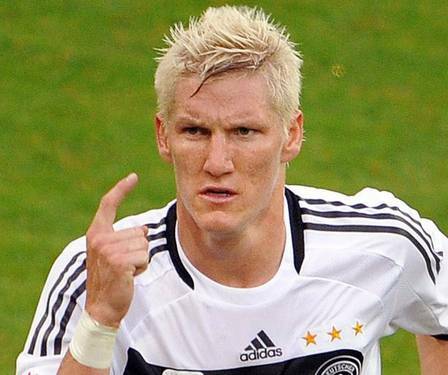 Michael Ballack, Bastian Schweinsteiger, Thomas Hitzlsperger and Piotr Trochowski were all in the 2006 World Cup squad. Added to these four experienced campaigners is the youthful exuberence of Marko Marin, Mezut Özil, Thomas Müller and Toni Kroos amongst others. Up front, Klose and Podolski are also veterans of World Cup 2006. Mario Gomez and Patrick Helmes have not been on form, but Stuttgart’s naturalised Brazilian Cacau gives the squad some attacking options. If there is a weakness in the German team, it is in defence. René Adler and Manuel Neuer are both capable goalkeepers but whichever ‘keeper wins the number one spot; he will be behind an increasingly shaky defence. Per Mertesacker and Philipp Lahm are regarded as world-class, but in truth Lahm is more of an attacking full-back and Mertesacker often shows a real lack of consistency. Arne Friedrich is the only defender with any top-level (World Cup) experience and serious questions will be asked of Serdar Tasci, Heiko Westermann and Marcel Schäfer as Germany progress to the latter stages of the World Cup. Germany’s progress is far from assured, though. In a group featuring Australia, Ghana and Serbia, a strong showing will be required to qualify from the group. Veritable aristocrats. Germany have qualified for every World Cup, and were winners in 1954, 1972 and 1990. 1954 was the year of “Das Wunder von Bern”- a final in which the Germans (competing as West Germany) faced the Hungarian Aranycsapat (Golden Team). The Aranycsapat, featuring the mighty Ferenc Puská s and Sandor Kocsis, then all-time top scorer at a World Cup final. West Germany won out 3-2, and became the only fully amateur side to win a World Cup. 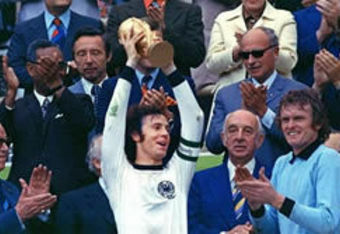 1974 saw West Germany again win despite facing overwhelming favourites The Netherlands in the final. The Dutch, complete with Johan Cruyff and their total football philiosophy, were defeated by a West German side featuring Franz Beckenbauer, Gerd Müller and Uli Hoeness. 1990 was Germany’s last World Cup as a divided nation and the country celebrated by winning again- beating Argentina 1-0 in the final. This German side was the one of Lothar Matthäus, Juergen Klinsmann and Rudi Völler. Germany have finished second four times at World Cups, and finished third twice including at the last World Cup on home territory. 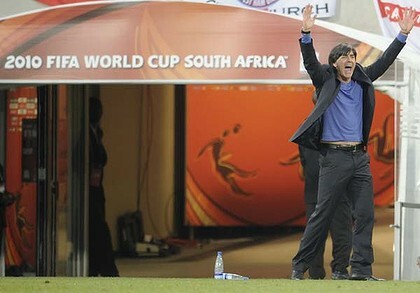 Löw took over as manager of the national team after a spell as assistant manager of the Klinsmann regime that led Germany unexpectedly to the semi-finals of the 2006 World Cup. After starting his managerial career with a stint at VfB Stuttgart, Löw won one German Cup and reached the final of the European Cup Winner’s Cup before moving to Fenerbahce for a brief period. In 1999 Löw was appointed head coach at Karlsruher SC but returned to Turkey with Adanaspor after he failed to avert relegation with Karlsruhe. Another short spell in Turkey followed, and Löw eventually moved to Austria with FC Tirol Innsbruck- winning an Austrian Championship. Months later, Innsbruck declared bankruptcy and Loew was left jobless again. Before being appointed as German Assistant, Löw served as manager of Austria Vienna for one season. After years of hard work at Bayern Munich, the midfielder is at last attracting the attention of big English and Italian clubs. Schweinsteiger is an immensely creative player who also chips in with goals- as his record of nineteen goals in seventy-three international appearances will attest to. Schweinsteiger has been at Bayern for all of his playing career and was a star this season in the Bavarian sides’ stellar 2010 campaign. Born in what once was Yugoslavia, Marin is hot property in German football. ‘Matchbox’ Marin is an attacking midfielder in the Zinedine Zidane mould, but can also play as a winger. Now a regular in the Werder Bremen side that look set to claim third place in the Bundesliga, Marin moved to Werder for 8.5 million from Borussia Moenchengladbach last summer. Marin is a flair player in the Werder team- succeeding Diego as the main creative force. At Moenchengladbach, Marin won promotion to the Bundesliga in 2008 and a year later won the European Under-21 Championship. In his first full match for the German senior side, Marin scored against Belgium. If Marin gets the licence to fully use his attacking ability he could well be a major string on the German bow.